When I see them like this, sometimes I think to myself "Am I really their mother?? Did I manage to care for them and love them bring them to this point?" I am so blessed with such healthy, happy, fun, kind children. So for Mother's Day, I made THEM gifts. 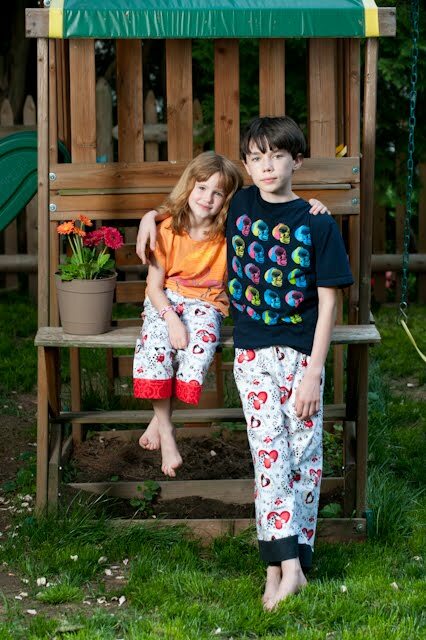 Matching PJs from the great Scientific Seamstress pattern for Easy Fit Pants. The fabric was from *gasp* Joann, and was not designer per se. But it reminded me so much of them. It says "Did you kiss your dog today?". They both love our dogs to death. The long and short of it is I had a wonderful Mother's Day. I am so fortunate to have these amazing little creatures in my life.